Lake Tyler and Whitehouse Dam are in the Neches River Basin in Smith County, Texas. Located 12 miles southeast of Tyler on Prairie Creek, a tributary of Mud Creek, which is tributary to the Angelina River, which in turn is tributary to the Neches River. Mud Creek Dam and Mud Creek Lake are in the Neches River Basin in Smith County, 12 miles southeast of Tyler on Mud Creek, a tributary of the Angelina River, which is a tributary to the Neches River. The two lakes were joined by a canal on May 29, 1968. Water rights to 30,000 acre-feet of water annually for municipal, domestic, and industrial use was obtained by Permit No. 1435 (Application No. 1546) dated March 25, 1945 from the State Board of Water Engineers. This authorization was amended by Permit No. 1843 (Application No. 1988) dated October 1, 1956 increasing total diversion to 50,000 acre-feet of water, including the 20,000 acre-feet from Mud Creek Reservoir. This Permit also authorized raising the dam and spillway 1 foot, which increased the storage capacity of Lake Tyler by 1,100 acre-feet. Construction of Whitehouse Dam began April 30, 1948 with deliberate impoundment of water beginning January 8, 1949. The structure was completed and accepted May 13, 1949. 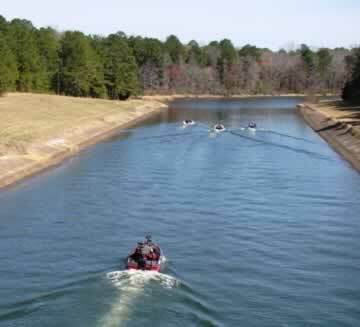 Operating as one unit, Lake Tyler Reservoir is connected to the Mud Creek Reservoir (Lake Tyler East) by a canal. Construction work was started on Mud Creek Dam February 11, 1966 and impoundment of water began November 22, 1966. Whitehouse dam is a rolled-earth structure 4,703 feet long and 50 feet high with the top of the dam at elevation 390.0 feet above mean sea level. The upstream face of the embankment is protected with 24 inches of rock riprap (loose stones used to form a foundation) on a 9-inch gravel base from elevation 355.0 feet above mean sea level to the top of the dam. The spillway height has been raised 1 foot above the original design. The lake has a capacity of 43,400 acre-feet and a surface area of 2,450 acres at spillway crest level of 375.5 feet above mean sea level. It is used for the city of Tyler's water supply and for public recreation. The service spillway is about 300 feet from the left end of the dam. It is an uncontrolled concrete chute flume with crest length of 200 feet at elevation 375.5 feet above mean sea level. Water discharges to a stilling basin, then through a channel to the creek 1,000 feet downstream from the dam. The maximum design discharge is 17,500 cubic feet per second with lake elevation at 384.3 feet above mean sea level. The diversion facility for Tyler's water supply is located about 2 miles upstream from the dam. The intake tower is equipped with three pairs of circular sluice gates: one pair at elevation 362.0, one pair at elevation 356.0, and one pair at elevation 350.0 feet above mean sea level. The water flows from the intake through a 48-inch concrete pipe, 660 feet long, to the pump house and then delivered through 2 pipelines to the filter plant or to a raw-water storage lake 8 miles away. Two 12-inch, cast iron pipes are installed through the base of the dam for future municipal water supply to other cities. Mud Creek dam is a compacted-earth structure with a concrete spillway near the center. The dam is 50 feet high above the stream bed with a total length of 4,700 feet. The top of the dam is 20 feet wide with crest elevation 390.0 feet above mean sea level. The embankment slopes are 2.5 to 1 with the upstream face protected with 18 inches of rock riprap placed on an 18-inch gravel base from elevation 366.0 to 386.0 feet above mean sea level. The downstream face will be sodded with Bermuda grass for protection. The lake has a capacity of 44,000 acre-feet and an area of 2,570 acres at elevation 376.0 feet above mean sea level. This new lake is connected to present Lake Tyler with an excavated canal with the bottom at elevation 355.0 feet above mean sea level.The drainage area above the dam is 65 square miles. The spillway located near the center of the dam is a reinforced concrete structure with a broad-crested weir with a crest length of 300 feet at elevation 376.0 feet above mean sea level. The spillway discharge basin has a length of 240 feet and slopes from the crest to the end of the basin at elevation 322.0 feet above mean sea level. Chute blocks, baffle blocks and end wall are installed on the last 19 feet of the concrete basin slab. Beyond the end wall the channel floor is protected for an additional 50 feet with 2 feet of large rock on a 1-foot gravel blanket. The low-flow outlet is a 260-foot long 20-inch steel cylinder concrete pipe extending from a concrete basin near the upstream toe through the embankment. The pipe is further encased in concrete with anti-seepage collars spaced 40-feet apart. The discharge is controlled by a slide valve with the operating rod extending up the embankment. The slide valve flange is located with invert at elevation 346.75 feet above mean sea level. A valve will be installed on the downstream end of the pipe for additional control and future water supply connection. You can find more information in TWDB's Volumetric Survey TWDB Tyler 2013 Final Report. View all current conditions at Water Data for Texas.